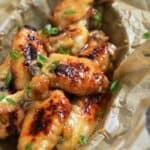 These Apricot Ginger Chicken Wings are baked not fried, super easy to prepare, and crazy delicious! Preheat oven to 450 degrees. Line a baking sheet with parchment paper or foil, and coat with olive oil spray. Set aside. Combine the preserves, ginger, garlic, salt, and cayenne pepper in a food processor. Process/Pulse until the ginger and garlic are finely chopped. Stir in the vinegar (remove the blade first). Place the wings on the prepared baking sheet. Brush with 1/2 of the glaze mixture. Return to the oven and bake for an additional 15 minutes. Grab some napkins and a drink and dig in! I used Bonne Maman Apricot Preserves. Crystallized ginger can usually be found in the bulk bin aisle or the baking section.